Each March, Plant City, Florida celebrates their strawberry harvest for 11 straight days and nights. This year, they’re starting the festivities a day early when the Florida Strawberry Festival kicks off on Thursday, February 28 and runs until Sunday, March 10, 2019. What started in 1930 has grown to an annual event that draws premiere headlining entertainment and over 500,000 visitors each year. 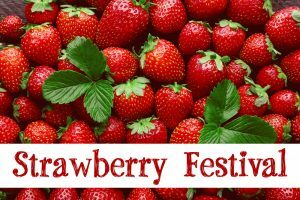 Here is some of the fun you can experience at the 2019 Florida Strawberry Festival. The Florida Strawberry festival serves all things strawberry. From chocolate-dipped strawberries and strawberry milkshakes to strawberry pie and their world-famous strawberry shortcake, the event will likely leave its mark on your stomach and probably your shirt. Adventurous guests can even purchase a slice of strawberry pizza on their way to the concert of the day. The festival features live concerts each day of the event at the outdoor Wish Farms Soundstage. Prices vary for each performance depending on the headline entertainment. This year’s line-up welcomes such massively successful artists as Aerosmith’s Steven Tyler, Martina McBride, STYX, Kool & the Gang, and country music legends Willie Nelson and Alabama, among others. In between the food vendors and music tents rests a land of thrills. The festival includes the Belle City Midway full of carnival rides, games, and attractions as well as pint-sized rides for younger children at the SunnyBell Kiddie Korral. Wristband purchases are required for unlimited rides each day. Adults who lack the digestive tolerance for rides can browse the Neighborhood Village. Located on the east side of the festival, the village is a marketplace where community members can sell homegrown and handcrafted goods. The festival also showcases art exhibits and youth livestock shows. Just outside of Orlando, the Florida Strawberry Festival is an-inclusive, all-welcoming week-and-a-half of Florida fun. When planning their visit to the festival, savvy vacationers book-end their trip with a day at one of Orlando’s theme parks. To make the most out of your trip, book a stay at the Rosen Inn International. Conveniently located on I-Drive, the Rosen Inn International provides quick access to I-4 and all the attractions in Orlando. To reserve your stay, call us today at 407-996-1600.